Bayard Rustin was one of the most important, and yet least known, Civil Rights advocates in the twentieth century. He was born in West Chester, Pennsylvania and raised by his maternal grandparents. His grandmother, Julia, was both a Quaker and an active member of the National Association for the Advancement of Colored People (NAACP). Quakerism, and NAACP leaders W.E.B. Du Bois and James Weldon Johnson, who were frequent visitors, proved influential in Rustin’s life. Rustin attended Wilberforce University (1932-1936) and Cheyney State Teachers College (1936), in each instance without graduating. After completing an activist training program conducted by the American Friends Service Committee (AFSC), he moved to Harlem, New York in 1937. In Harlem, he enrolled at the City College of New York, began singing in local clubs with black folksingers including John White and Huddie Ledbetter, became active in the efforts to free the Scottsboro Boys, and joined the Young Communist League, motivated by their advocacy of racial equality. By 1941, Rustin quit the Communist Party and began working with union organizer A. Philip Randolph and A.J. Muste, leader of the Fellowship of Reconciliation (FOR). Together they organized the March on Washington Movement which protested segregation in the military and African Americans exclusion from employment in defense industries. Their protests resulted in President Franklin Delano Roosevelt issuing Executive Order 8802 creating the Fair Employment Practices Committee. Rustin along with FOR members George Houser, Bernice Fisher, and James L. Farmer helped create the Congress of Racial Equality (CORE) which pioneered the civil rights strategy of non-violent direct action. In 1944, he traveled to California to help protect the property of Japanese Americans interned during the war. In 1947, he and Houser organized the Journey of Reconciliation, the first Freedom Ride testing the Supreme Court decision outlawing racial discrimination in interstate travel. After organizing FOR’s Free India Committee, he traveled to India to study nonviolence; and to Africa meeting with leaders of the Ghanaian and Nigerian independence movements. As a pacifist, Rustin was arrested for violating the Selective Service Act and was imprisoned at Lewisberg Federal Penitentiary from 1944 to 1946. Throughout his civil rights career he was arrested twenty-three times, including a 1953 charge for vagrancy and lewd conduct in Pasadena, California. Rustin was openly gay and lived with partner, Walter Naegle, at a time when homosexuality was criminalized throughout the U.S. He was subsequently fired by the FOR, but became executive secretary of the War Resisters League. He also served as a member of the AFSC task force that wrote one of the most widely influential pacifist essays in U.S. history, “Speak Truth to Power: A Quaker Search for an Alternative to Violence,” in 1955. In 1956, Rustin went to Montgomery, Alabama and advised Martin Luther King, Jr. on nonviolent strategies of resistance during the Montgomery Bus Boycott. King and Rustin helped organize the Southern Christian Leadership Conference (SCLC). However, in 1960 New York Congressman, Adam Clayton Powell, Jr. forced him to resign from SCLC due to concerns shared by many black leaders about Rustin’s homosexuality and communist past. Due to the combination of the homophobia of these leaders and their fear he might compromise the movement, Rustin would not receive public recognition for his role in the movement. Nevertheless, Rustin continued to work in the Civil Rights Movement, organizing the seminal 1963 March on Washington for Jobs and Freedom with A. Philip Randolph. 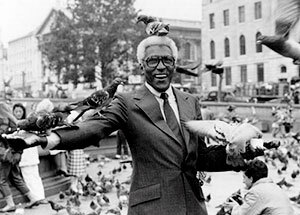 Throughout the 1970s and 1980s, Rustin remained politically active. Although he often shared their commitment to human rights, Rustin was a vocal critic of emerging black power politics. Toward the end of his life he continued to work as a human rights advocate, while serving on the Board of Trustees of the University of Notre Dame. The year before he died he testified in favor of New York State’s Gay Rights Bill. Bayard Rustin died in New York on August 24, 1987 from a perforated appendix. John D'Emilio, Lost Prophet: The Life and Times of Bayard Rustin (Chicago: The University of Chicago Press, 2004); Jervis Anderson, Bayard Rustin: Troubles I've Seen (New York: HarperCollins Publishers, 1997); James Haskins, Bayard Rustin: Behind the Scenes of the Civil Rights Movement (New York: Hyperion, 1997). John D’Emilio, Lost Prophet: The Life and Times of Bayard Rustin (Chicago: The University of Chicago Press, 2004); Jervis Anderson, Bayard Rustin: Troubles I’ve Seen (New York: HarperCollins Publishers, 1997); James Haskins, Bayard Rustin: Behind the Scenes of the Civil Rights Movement (New York: Hyperion, 1997).